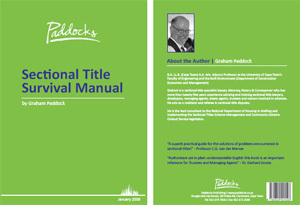 The Sectional Title Survival Manual has been a crucial component in the history of Paddocks. For the last three decades, this manual has driven the company’s growth, innovation and expansion into new and exciting areas. But where did it come from, and how did everything start? Back in the late 1970s, Graham Paddock worked in the conveyancing department at a prestigious Cape Town law firm. It was here that he came to realise that sectional titles was a new sector of property law which many lawyers knew little or nothing about. In a developing country like South Africa, Graham realised that it was inevitable that more and more new developments were going to established as sectional title schemes. Cities needed to maximize the use of existing infrastructure and expand upwards and could not continue to sprawl outwards indefinitely. At this point Graham decided that he would move into this space and learn everything there was to know about sectional titles. As time went by, Graham became one the few specialists in the field and found that there was a desperate need for a clear, understandable guide to the law for sectional title owners, trustees, managing agents and ordinary South Africans who had little knowledge of sectional title legislation. He decided to write a book that would educate the masses about sectional titles. Graham spent his evenings hard at work on the Sectional Title Handbook, which would later evolve into the Sectional Title Survival Manual. Graham would often sit up until the wee hours of the morning, passionately involved in putting together his book. The book, based on the original Sectional Titles Act 66 of 1971, was published in 1983. When Act 95 of 1986 came into effect and a complete revision was required, Graham sought inspiration for a cover design from major global brand packaging, which explains why the second edition of the book looked like a Diet Coke can. By the time the book was reinvented as the Sectional Title Survival Manual it was time for a new look and Graham’s 17-year-old son, Robert, designed the front cover. The inspiration came from the South African fifty Rand note, the idea being that when people saw the book they would think that purchasing it would save them money. This book was the first comprehensive and accessible guide to the law of sectional titles. It became an immensely popular reference guide for owners and trustees, giving a no-nonsense breakdown of the Sectional Titles Act and the prescribed rules. As subsequent editions were required Graham continued to refine the text so that it was written in plain English and without any confusing legalese. By the start of the new millennium, Graham realised that while the Survival Manual was useful for understanding the daily affairs that affected owners, managing agents also needed a thorough reference guide to the more complex issues that arose. He initially started to write a book specifically for managing agents but then he teamed up with the National Association of Managing Agents (NAMA) and the University of Cape Town’s Faculty of Law to create an intensive 6-month online course. The UCT (Law@Work) Sectional Title Scheme Management course became the standard qualification for managing agents and was the foundation of Paddocks and, in turn, led to more courses and the founding of Paddocks’ sister education company, GetSmarter. The Sectional Title Survival Manual is now in its sixth edition, has been translated into Afrikaans, and is a standard reference book at managing agencies and property firms around the country. It continues its steady sales to this day. Graham is proud of this book, which was the inspiration for many more resources, products and services offered by Paddocks. Graham’s expanding range of books have had a substantial impact on the sectional title landscape, educating managing agents, trustees and owners and making scheme management information accessible and available in plain language. This impact continues today. For the month of March only we are celebrating this 30 year milestone by offering a 20% discount on all Paddocks Publications. Click here for more information about our Publications.